For all the soap opera, will-they-or-won’t-they? Pam-Jim subplots of The Office, the show has always been on the firmest footing when it simply focuses on the pulse of the American office. (Or a German or French office.) Last night’s episode started out with a classic American corporate conflict: increased efficiency through technology or old-school methods of face-to-face communications. The new guard vs. the old guard. The Palm Pilot vs. the desk calendar. It was tightly written, sharp and based in reality. And then Michael drove his car into a lake. 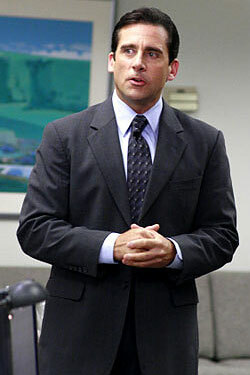 Steve Carell is obviously the star of The Office, and clearly the most talented and successful (though that Dan in Real Life movie has a treacly, cloying feel … and Dane Cook! ); it’s only a matter of time until his schedule’s too busy to keep up a weekly television program. The beginning of the season gives one the sense that this might necessarily not be a bad thing. Carell’s definitely funny, but his character is stuck in a man-boy rut. The show came alive last year when Michael was shown to be a sort of a competent employee; his methods might be infantile and insecure, but he wasn’t a drooling dolt. But this episode’s second-half subplot of Michael obsessing over in-person gift baskets and GPS trackers that send him into lakes turned him back into a cartoon character. Carell’s not an inherently showy performer, but he’s so skilled at buffoonery that the show can’t help itself sometimes. But his antics last night sent a promising episode careering off the rails.